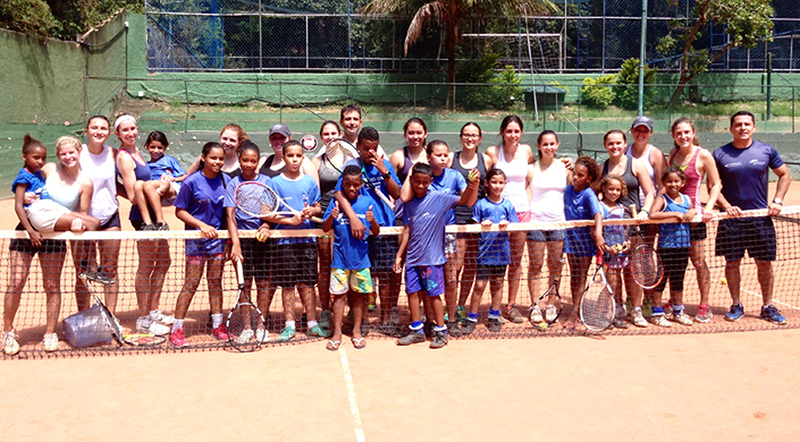 The Emory women’s tennis team pauses practice for a group photo with children in Brazil. The team traveled to Rio de Janeiro over the summer to improve their own tennis skills and volunteer their time to help children learn the sport. | Courtesy of Emory Athletics. Emory’s women’s tennis team will start its spring season on Saturday, Feb. 7, with an away game against the Division I University of Tennessee at Chattanooga Mockingbirds. “We’re excited to make 2015 something special,” Head Coach Amy Bryant said. With a National Championship win and a record of 28-2 last spring for the number one-ranked Division III ranking, the Eagles have set a high bar for the 2015 season. The team has already started a rigorous training schedule consisting of weight and conditioning training, private lessons and general practices. With such a rigorous work schedule, Bryant wants to train her Eagles both physically and mentally. The players haven’t had an official match since the end of their fall season, and they have not taken it easy in their time off, junior Beatrice Rosen said. When asked about the upcoming season, Bryant and Rosen gave similar sentiments about the way the team looks at its upcoming competitions. Some players used their free time in the off-season to give back to the community. Sophomore Katarina Su and freshman Anna Fuhr, along with Bryant and Rosen, spent their Wednesday afternoons volunteering with the Atlanta Youth Tennis and Education Foundation (AYTEF). AYTEF strives to provide positive extracurricular activities for children by giving them strong role models and something to look forward to throughout the day, according to the organization’s website. While, on the surface, the program focuses on improving tennis ability, it uses the venue of tennis to give these young men and women an escape into a positive environment to help them develop healthy lifestyles, the website says. In order to promote team unity and to jumpstart practices for the upcoming season, the Eagles took a trip to Rio de Janeiro, Brazil over the winter break. In the surrounding area, they taught local children to play tennis one day. There, they relaxed, ate good food, partied a little bit and played a lot of tennis, according to players’ daily journal entries published by Emory Athletics.